May 4, 2018, 5:41 PM · This week, longtime V.com member Karen Allendoerfer wrote about a personal discovery that she made a while back: that for her, she is able to perform better, both as a speaker and as a violist, if her presentation -- or music -- is memorized. For certain people, having a piece of music memorized is the best way to ensure a solid performance. For that kind of performer, often the sheet music can feel like a distraction or even a hindrance. But it's not the case for everyone. For others, having the music there provides security, relieving the performer of the stress of having a memory slip. If the stress of memorization dwarfs the entire act of performing, then having the music for the performance can be the best way to go. Personally, I feel much better, having memorized a piece. It means that I have a certain degree of mastery over it, and I find that I can pay better attention to what I'm hearing, if I have things memorize. Like I said, though, there are other views, for example this blog from Paul Stein describes some reasons not to memorize. What are your thoughts on memorizing? Do you find you play better by memory, or with the music? Please vote and then share your thoughts. May 5, 2018 at 01:33 AM · I think that memorization is an ideal, and I am really grateful that I've had the time to put in to commit the Telemann concerto to memory for my upcoming performance. But I don't always have that kind of time. I had to drop out of a learn-fiddle-tunes-by-ear challenge last year because it took me too much time. (I find the process of memorizing and of learning by ear to be somewhat similar. By the time I've managed to learn a piece by ear, I have it memorized). I was just doing the fiddle tunes for fun, whereas I had orchestra and chamber music that I had to learn for performance, and I had to spend my limited practice time on that music. So it depends. I think that given unlimited time and resources, I would always play better with the music memorized, but for a lot of the music I play, especially orchestra and chamber, it's just not practical or necessary to do so. On the other hand, even with orchestra and chamber music, it can really help to memorize passages and snippets here and there so that you can look up at and make eye contact with the conductor and/or your chamber music partners when necessary, or not have to drop out if it takes your stand partner extra time to get the page turned. May 5, 2018 at 01:58 AM · I voted no, but my answer is a little more complicated. In my one solo performance with an orchestra, I used music. I tend to play better with music because having the notes in front of me keeps self-doubt from taking over. But I played rubato passages by memory so that I could maintain eye contact with the conductor, and also used eye contact with the principal clarinetist to keep a short duet passage together. May 5, 2018 at 02:08 AM · I always perform from memory due to disability. May 5, 2018 at 02:19 AM · Can anyone enlighten me about what is so bad about a memory slip that it is so much more stressful than other kinds of slips or mistakes? 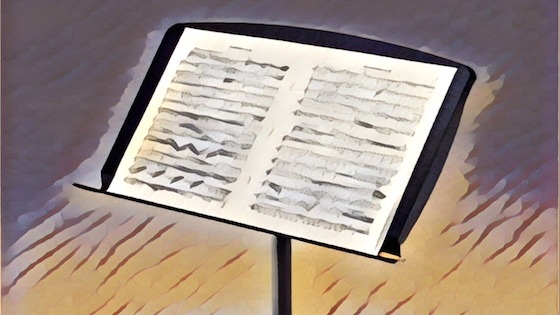 I get that a memory slip is something that you want to avoid in performance, but so is bad intonation, wrong notes, forgotten dynamics, a weak tone, lack of phrasing, etc. And so is what I'll call lack of fluency, the matter just getting "tangled up" and having to stop and repeat a passage. That is perhaps the main thing that memorization really helps me with, but it also helps me with the other things (intonation, phrasing, dynamics). So in the balance it's a net positive for nerves rather than a net negative for me. I can imagine if I had built up a memory slip as being an especially bad type of mistake in my mind, I might feel differently. And that keeps coming up as a reason people don't like to memorize. So what's behind that? What's so uniquely awful about a memory slip? (Although on the other hand, maybe I don't want to know! I'm pretty satisfied with regarding potential memory slips as just another obstacle to work on and overcome, like anything else with this instrument). May 5, 2018 at 09:06 AM · I think that I PLAY much better if I am not using the printed music, but the stress is so bad for me that other than a couple of early recitals in and after college, I have elected to use the music (even when I had the works memorized). In the case of a couple of pieces that I was able to play with orchestra, it was an agonizing choice, but ultimately I opted for using the print. In grad school, I had a chamber music coach who insisted that our quartet memorize a movement of a quartet we were working on, in order to work on our ensemble, and to free us to look at each other. As someone for whom memorization is very difficult, I didn't like having to do it, but it WAS a very good experience. I wish I'd done it more often. Now in my senior years and semi-retired, I am making myself memorize more, and enjoying it. Very very late, I will respond re memory slips, et al, tomorrow with truthful examples of Great's who even slipped in public which include both my famed Violin Mentor's, Jascha Heifetz and his great colleague, Nathan Milstein ~ Hopefully, after you've read authentically truthful & unexaggerated events about both these master violinists, your concerns regarding memory shall abait somewhat to be put in more human terms and perspective! For now, remember one thing: we become what we think! So it is best and smart to Not dwell on a common problem which occurs infrequently, but nevertheless does happen & comes w/ the 'dangerous' territory of playing in public ~ No matter what, our preparation is always key to avoiding most memory slips, so, if I may, here is a tip to de-focus your mind from fear's of forgetting to an obsession of knowing the score insanely well and practising violin solo parts on the Piano for a 'Back Up II' memory, harmonically. It's a harmony 'road map' of the music which is a very sure form of 'Memory Insurance' to purchase and practise!! May 5, 2018 at 10:15 AM · To me, it's more a matter of self-doubt than actual memory slips. I often develop a sneaking suspicion in the back of my mind that the correct note I'm about to play might be wrong. The result is that I play confidently with the music, and extremely tentatively without it, and my tone quality suffers. So, as I alluded to above, I always memorize and play from memory except at moments when I'm at risk of accidentally circling back, but the music is there to keep the doubt monsters away. May 5, 2018 at 02:05 PM · I was an actor for several years, so memorization was not a matter of choice. In the past decade I performed songs I wrote with a guitar in a variety of settings - music venues, restaurants, dive bars, and so forth. When I started out I took music onstage with me, but that didn't last long. One night I was playing my guitar in a small bar, and things were going well. Then someone opened an outside door and a strong breeze blew right across the stage. The sheets of music drifted to the floor and I stood there stammering, feeling metaphorically naked to the world. Needless to say, the rest of the performance was not my best. After that I took the time to always memorize the songs. My worst moment happened several years ago when I was playing classical guitar in a recital. I was unsure of the music so I took the score onstage with me. Well, my eye skipped a line on the page, but my fingers just kept right on playing what they should have played. I got confused, jumbled, and ground to a quick stop. I was so embarrassed I never played classical guitar again. After all of this, I suggest memorizing the material. Internalize it and the music will become part of you. May 5, 2018 at 02:48 PM · Yes, I play better from memory. I can play with more abandon that way, not having to concentrate on printed notes on a page. Still, I like to have the sheet music available, just in case. Personal memory isn't a totally reliable filing place. My ideal is to have the music open but not be looking at it -- except for those moments when I need to turn the page. Then, in case of a memory lapse, I have a safety net. Fortunately, once I learn a piece, I have a good picture in my mind of which passages are on left-hand or right-hand pages -- and which lines of these pages they're on. Then, if I need to use the safety net, I don't have to search through the page -- I know where to aim. I, too, had some acting experience -- in high school -- a LOT of memorization required. What helped, more than just straight memorization, was to have a classmate or friend read from random parts of the script and see if I could pick up my next lines right away -- no full context to fall back on. This paid off in performance when my leading lady inadvertently skipped a line -- and I had to skip ahead, too, even though it meant being deprived of one of my best zinger lines. Same with music. If I can start at random measures of the score and pick up my next lines without hesitation -- really knowing them cold -- then I'm more secure. If my accompanist inadvertently leaves out a measure or two -- and these things can happen -- then I know where to go. May 5, 2018 at 03:39 PM · My violin playing ultimately comes from an Irish folk fiddle background where everyone is expected to learn the music by ear and does so, or else. Historically, this probably comes from a period when few folk musicians could read music, although that doesn't often apply today. The presence of sheet music in a folk session is a big no-no! Typically, you'll see a ceili band doing a 3 hour gig entirely from memory and the only sheet of paper you're likely to see on stage is the leader's running order. The spin-off of this background is that in orchestra I'll memorise as much as is necessary of a page of my score to help with an awkward page turn. Also, it is useful to memorise the occasional tricky technical bits. A disadvantage of learning tunes from printed folk music tune collections instead of by ear is that the tunes were transcribed by collectors from real players. What you see in print is the bare bones of the music as transcribed - no phrasing, slur indications or dynamics. As I see it, the problem is that today an inexperienced player who hasn't learn by ear from a face-to-face teacher will be learning a tune from a printed source and have no real idea of what it should sound like and how it should be played, their take on it being a literal playing of what they see on the page. Consequently, all their bowing tends to be one bow per note irrespective of the speed and phrasing. May 6, 2018 at 03:19 AM · Everything I would say was already said by several people. One unique thing I found, and in fact it was while learning the Telemann Viola Concerto, is that if I'm playing fast and the music shifts into treble clef and I have to go out of first position, it is much easier to play it correctly when I have it in my muscle memory. In that situation, reading the notes actually takes my concentration away from the performance of the music. May 6, 2018 at 07:29 PM · Fran, you know, that might be a factor for me in learning the Telemann viola concerto. I think I'm fully fluent in alto clef at this point, but it's still not my mother tongue. So there still might be a layer of extra concentration needed to read the sheet music that I'm bypassing by memorizing it. If it were in treble clef, I wonder if it would be easier or harder for me to memorize! May 6, 2018 at 10:18 PM · P.S. Could have had another choice rather than must yes or no. Somethings work better memorized and some things don't. I am better at memorizing plays than music. Our brain is what tells us why to do and where go go - not our muscles - they have no memory. Note: some "folk musicians" and "traditional musicians" who composed what are now considered traditional folk music wrote down this music - written compositions - and we can find it; we can have a good idea of how the composer may have wanted it done, or at least the bones of it and left the filling it out to the musicians of the time.. Leaning a piece badly by ear, i.e., folk music or other music, is just as problematical as learning it badly from written music. The performer we are copying may not be good, may be driven by a style of music that is not in that particular genre - we are learning by ear and memorizing so it must be good. Bad learning is bad learning, whether from music or by ear. Bad memorizing is bad memorizing. I happen to like the music available. I play both by ear, some memorization, and some from the music. I say, do what works for you. Performers did not always play their music memorized - thank a pianist - so what is the problem. May 7, 2018 at 04:17 AM · I perform better using music, even if I don't end up looking at it much. I feel that when I do not use music, I am using part of my attention just to remember which notes and rhythms I am supposed to be playing, when to come in, and visualizing the sheet music, and that this diversion of attention often makes everything else more difficult and adrenaline filled. I guess that makes me a terrible multi-tasker. Improvisation using partially composed music and chord charts, however, is a whole different ballgame for me. May 7, 2018 at 02:27 PM · One advantage I find in playing a piece by heart is that I can project a better sound to my audience, simply because I'm facing them and not the music. As a result, I am able to establish a closer connection with my listener. I once attended a recital of a world famous violinist who came to Miami. He played his entire program off the sheet music. Though his playing was impressive, he had his nose glued to the music the whole time. At the end of it all, I was disappointed. I admire "old-school" violinists like Aaron Rosand who memorize their entire program and play - not read - their music to their audience. May 7, 2018 at 02:35 PM · It depends a lot on the circumstances. Apart from playing the violin and viola I also sing in a choir. A very good male choir that does advanced stuff. We do memorize some pieces. There is a huge "standard repertoire" that we can just perform anytime. And with those pieces the conductor has much closer contact since nobody is staring at the music. But there is also a tendency to sloppiness - nuances are sometimes forgotten, rhythms are a bit off etc. With the more advanced stuff there is no time for us to memorize it all. So at the price of slightly worse contact with the conductor there is a lot more detail that gets right. Going back to violin playing - for solo performances I prefer to have the pieces memorized. Then I might choose to have the music there anyway, but I like to know that if the light goes out or the music falls off the stand I can just go on. The problem is that if the music is there I tend to look even if I don't need to. With chamber music I always play from the music. There will often be notes I put in regarding who is controlling the tempo at a certain spot etc. Difficult fast passages I will often have memorized simply because there is no time to read it. Tomorrow I have a chamber concert with members of our orchestra. I will be playing Amy Beach Romance (Thank you, Mary Ellen for bringing that to my attention a while back) and Prokofievs Quintet for oboe, clarinet, violin, viola and double bas. I haven't yet decided whether or not to bring the music for the Romance, but there is no way I will attempt the Prokofiev without! May 7, 2018 at 03:11 PM · I think the distinction between solo and not is important: playing solo, memorization is the only way. I'd argue that major sonatas like Brahms and Beethoven should also be memorized. Chamber music can be played from the music--most of us don't have decades to memorize it like a pro quartet. May 7, 2018 at 03:43 PM · Having the music memorized allows me to better focus on phrasing. That said, I can't reliably memorize music. It falls apart the minute I am under stress, no matter how well I memorized it. I must use the score when performing, which is not to say I read every notes but rather use it to trigger my memories. I am always amazed by those who can perform for hours from memory as it is totally out of my reach. May 7, 2018 at 04:23 PM · "Can anyone enlighten me about what is so bad about a memory slip that it is so much more stressful than other kinds of slips or mistakes?" How about this for enlightenment. Imagine yourself playing a concerto and going for a high note and missing that by a half-step because you were nervous, or having a spiccato passage go all wonky on you, and then continuing as before. That's a "slip or a mistake," right? Now imagine yourself getting 16 bars into a concerto that you've played from memory a couple of dozen times without problems, having a memory blackout, starting over, getting 16 bars into it again, and having the same blackout, and having to go over to the pianist and look at the music to see what comes next, so that you can start again for the third time and finally play the whole piece. In front of an audience, with video cameras rolling. Thus, for some, nerves cause intonation slips and passages that were once smooth to become halting and rough. They continue, their imperfections notwithstanding. For others, nerves cause memory failures that lead to total breakdown of the performance. Now I ask you, Karen, whether you agree that those two scenarios might be just a teensy weensy bit different? (Presently withholding any response, I think it wise to clarify just whom you are referring to in writing about a great concert artist who '... Though his playing was impressive, he had his nose glued to the music the whole time. ...' I've an inkling a few or some here might wonder whom you are speaking and criticising, which requires some sort of explanation in lieu of your description of a 'world famous violinist', dear Alexander! May 7, 2018 at 04:31 PM · Wow. And I thought *I* was cranky. Quite the scrapbook! Seems unlikely that his selection of the photo with Milstein for his profile here would have anything to do with his comments on this post. May 7, 2018 at 06:51 PM · My two violin heroes, Jascha Heifetz (who I never met) and Nathan Milstein (who I'm pictured with), always played their programs by heart. Please note I never criticize anyone who musters the courage to play the violin in public, regardless of whether they are beginners or world class artists, which is why I never mention names when I am - as a matter of personal opinion - disappointed (though I did clearly state, the playing was impressive!) Much love, respect, and great admiration to Ms. Matesky. Many have urged and suggested my penning a Book on a blessed musical career due to one's providential study with both Jascha Heifetz and Nathan Milstein plus Chamber Music w/Gregor Piatigorsky & William Primrose whilst studying with Mr. Heifetz at USC plus!!! May 7, 2018 at 08:36 PM · Dear new Friend, Alexander Saldarriaga !! should enjoy an email conversation about all things Piastro!! Truly moved at your response, please accept heartfelt apologies from me as an over protective pupil-colleague (once under the same London Concert Artist Management) and longtime friend of Nathan Milstein, who was one of the Greatest Violinist's of All Time & (IMHO) opinion, peer of Mr. Heifetz!!! I owe you an apology and officially apologise here for wondering if Milstein might have been one your description applied to ~ I'm deeply sorry, dear Alexander, and invite you to keep in email touch via my professional email address which is accessed on my www.linkedin.com/Profile under Elisabeth Matesky. Sending you warmest musical greetings, I hope to hear from you! May 8, 2018 at 06:25 AM · Karen, I would guess it depends on which instrument you feel most fluent in. I found it easy to memorize violin pieces before the viola came into my life. Now I think in alto clef. I envy those who can pick up either instrument and their brain automatically switches based on how the instrument feels to their bodies. Best wishes on your upcoming performance! May 8, 2018 at 04:35 PM · Paul, a similar scenario actually happened at a Society for Neuroscience Meeting to someone I knew. It was a different meeting than the one I wrote about in my original blog, but it was the same 10-minute talk scenario. The person in question got a few minutes into her talk and didn't remember what came next. There was blank silence. And then she went back to the beginning of the talk and started over. In her case, she made it through the second time. So no, it wasn't *exactly* the same as your scenario, but it was a memory breakdown that resulted in going back to the beginning and starting over. With the audience and speaker both being neuroscientists, the discussion afterwards was about how and why it was necessary/helpful to go all the way back to the beginning rather than to just a few sentences before. Why does the brain work that way? The overall response from the audience was one of admiration, not censure. The person in question is now a professor at a major research university and has given hundreds of talks from memory since then. I'll save the story about the piano falling apart during the trio I was playing in and having to play the entire movement again after intermission for another time, but it was another example of a worst case scenario being survivable. The brain is really a strange, crazy, and wonderful thing. And I may have learned more from watching people give talks than from the actual content of the talks. May 9, 2018 at 02:19 AM · My other reply on this topic is on Karen A's other post. I have done most of my playing, not all, as a Mariachi violinist. Everything is memorized. The sheet music is usually not available, unless you transcribe it yourself from a recording. The hardest part of that for me was connecting the title with the first note. When I worked with Los Camperos, six nights a week, 8:00-2:00, every week for a year the keys to some songs would change depending on which singer was on that night, and was I constantly switching between lead, second, or third harmony part, depending who was there. May 9, 2018 at 11:44 AM · Thankfully when I give scientific talks or lectures I do not have to memorize a script. I've got my slides and just use them as "talking points." I thought everyone did that. May 9, 2018 at 11:48 AM · Elizabeth I think we all would love to see that photo of you playing with Milstein! I don't blame you if you save it for your book though. May 9, 2018 at 04:24 PM · For me it depends on the length of the talk, how much gets truly memorized. In later years, when I was an older graduate student and a postdoc, at meetings I tended to present posters on my work anyway, rather than slide talks. I prefer the more personal, informal interactions with colleagues that you get at a poster. I haven't been to the Society for Neuroscience meeting for a while now since I switched fields to education and outreach. But these days, especially in classroom teaching, we're trying to get away from power point slides and talking points and make classes more student centered. So no, I don't think "everyone" does that. The parallels between giving scientific talks and performing music aren't exactly perfect, but the similarities have come up for me while preparing for this concerto performance. When I was younger I had dreadful performance anxiety, both for giving talks and for performing music. I was terrified of the scenario Paul described, of having *everything* fly out of my head due to nerves, which then of course became a self-fulfilling prophecy. But I discovered that even that experience is survivable. And there are even worse things that can happen--like falling off the podium, or having the piano fall apart as it is being played--which are also survivable. And, at least for me, even that "everything flies out of my head leaving me standing there like an idiot" phenomenon is a temporary phase that can be overcome with more preparation. One doesn't always have time for enough preparation, so I'm definitely not saying that everyone has to memorize music. I agree with the poster who said "do what works for you." What held me back, though, both in school and while preparing to perform music, was the belief that a memory breakdown is a total and disgraceful catastrophe that must be avoided at all costs, and which can never be overcome. None of that is true. May 10, 2018 at 10:58 AM · Oh it's happened plenty of times lecturing when I'll maybe take a question from a student, answer that, then look at my notes, look up at my students, and say something like, "Now, what the hell were we talking about?" or "I just realized the next thing in my notes makes absolutely no sense at all." And we'll all have a good laugh and get back to it. You can't really get away with that when you're performing a Mozart Concerto. Scientific lecturing and teaching is much more akin to improvised music in many ways. You've got a framework (which probably one knows quite thoroughly if it's one's own research or some intermediate-level course material), a toolbox of well-learned facts, crutches ("illustrations") in the form of powerpoints (mine have absolutely minimal text), and even some canned phrases. All of that can be put together on the fly, and it's never the same way twice. When you get to the point where you trust yourself to do that, it's very liberating. I also play jazz piano and I'm perfectly comfortable to play for hours with just a basic fake book and whatever other instrumentalists happen to be on a particular gig with me.